We design spaces shaped with purpose, lush with plantings and accentuated by compelling surfaces and light. 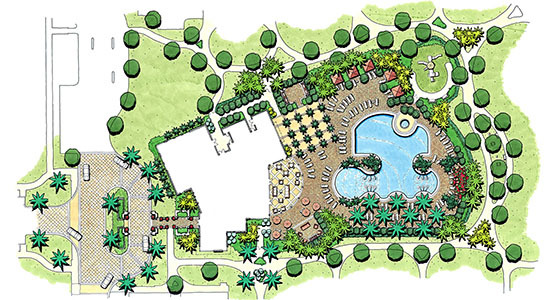 Landscape Design Workshop is an award-winning landscape architecture and planning design studio. Our projects from the Ritz Carlton Residences in Singer Island, Florida to Villa Magnolia in Bal Harbour, Florida showcase our passion for design excellence. Landscape Design Workshop specializes in designing multi-family communities that epitomize the Florida Lifestyle experience. We do it by extending the interior living area to the outdoors; creating spaces for lounging, dining, socializing, exercising and entertaining. Landscape architecture and planning by Landscape Design Workshop fulfills the need for more than “just” an outdoor green space, more than an easy-flowing walkway, more than a topical retreat. Our designs provide a strong and unified community identity and civic value to enhance the residents’ well-being and quality of life. Regardless of project classification, from simple to complex, we carefully consider the purpose of the space, the experience it should invoke, and the practicality of the plan that we create. Florida’s lush, tropical appeal is displayed elegantly in our creative landscape designs and amenities for residential developments from small to large, from classically understated to the extraordinary. 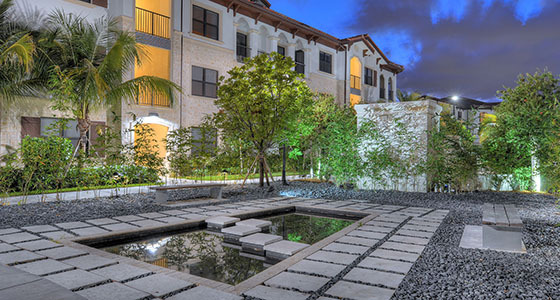 Our extensive portfolio for resort communities has enhanced over 10,000 units with inspired streetscape, lighting, water feature and garden amenities that surprise and delight. Our boutique studio caters to the South Florida developer, property manager and community association leader who recognize the advantages that thoughtful planning adds to their residential, resort or mixed-use assets. Our landscape architecture services satisfy the special needs of our clients by integrating vision and meticulous design to produce environments that not only create a desirable lifestyle, but also increase property values and profitability with a focus on market absorption potential. We immerse ourselves in each project with purposeful dedication. As such, Landscape Design Workshop focuses on a finite number of projects at once, giving them both the attention they deserve and the benefit of our high standards from concept through to completion. Landscape Design Workshop specializes in designing multi-family communities that epitomize the Florida Lifestyle experience. Landscape Design Workshop combines the vast market experience of a long-established practice with the youth, enthusiasm and technological savvy of a young practice. At Landscape Design Workshop, we specialize in creating a signature lifestyle statement for every project that maximizes the experience of its residents, accomplishes the client goal, and creates lasting value.